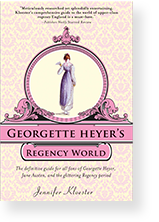 Georgette Heyer’s historical novels and Regency romances have charmed and delighted millions of readers for decades. 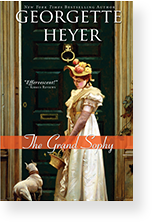 But Miss Heyer remained a very private woman. Her identity was a mystery to most of her fans during her lifetime and she refused all requests for interviews or comments. 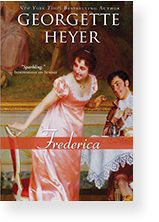 “I am to be found in my work,” Miss Heyer wrote when asked to divulge details of her childhood or personal life. She was born in Wimbledon in August 1902. 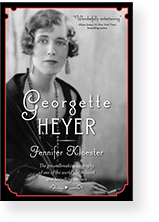 Her first novel, The Black Moth, was published in 1921 with the help and encouragement of her father, George Heyer. Four years later, at the age of 23, she married mining engineer George Ronald Rougier, with whom she had a son, Richard. However her married name was unknown to fans until after her death, when her obituary was printed. She was a prolific writer and her large volume of 52 novels is due in part to her habit in the 1930s of writing one romance and one mystery novel a year. In that period she also spent much time working on her historical fiction, for which she did meticulous research. 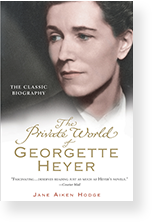 Georgette Heyer is legendary for her research, historical accuracy and for her extraordinary plots and characterizations. She passed away in July 1974; her last book, My Lord John, was published posthumously in 1975.